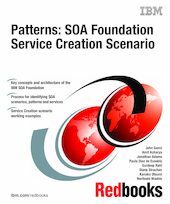 This IBM IBM Redbooks publication provides an introduction to the IBM SOA Foundation, and includes a detailed implementation example for the Service Creation scenario. Part 1. "Getting started with IBM SOA Foundation,” includes an introduction to SOA from a business and architecture perspective. We describe the key elements of the IBM SOA Foundation, including the SOA life cycle, logical architecture, and SOA scenarios. Next we describe the Service Creation scenario in more detail since this is the focus of book example. We describe best practices and guidelines for SOA. In addition, we include a process for applying the SOA scenarios and patterns. Part 2 "Service Creation scenario example,” provides an end-to-end working example representative of the Service Creation scenario. We start by modeling the business requirements of a fictitious car rental company that has an existing J2EE based application. We demonstrate how to identify services using SOMA, and use a process for applying the SOA scenarios and reusable patterns to accelerate the creation of a solution architecture. The remaining chapters provide the implementation details to assemble using Rational Application Developer V6.0.1, deploy using WebSphere Application Server Network Deployment V6.0.2, and manage the solution using Tivoli Composite Application Manager for SOA V6.0.